A facility monitoring system (FMS) is a process monitoring tool that collects data from sensors such as optical particle counters, differential pressure sensors, and temperature probes in real-time. 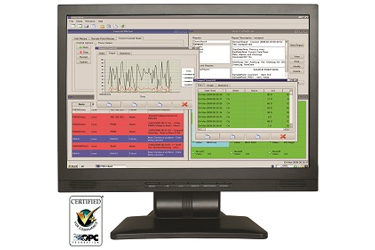 Acronyms are independent monitoring system (IMS) or environmental monitoring system (EMS). Software presents that data as information; real-time alarms notify facility operators of alert limits to enable an immediate response to an unwanted event or excursion. Reports and trend graphs can be produced. This information can then be used to help improve process understanding and enhance process knowledge. The quality of the data input into the facility monitoring system will directly impact the quality of the process information and knowledge gained from the system. In the pharmaceutical industry, aseptic processing is monitored—in accordance with regulatory requirements—to prove the environment surrounding a process does not negatively impact product quality and, ultimately, patient safety. Environmental parameters monitored include temperature, relative humidity, differential pressure, and airborne particles. Compliance to regulatory guidelines such as the European Union's Guidelines to Good Manufacturing Practice, Medicinal Products for Human and Veterinary Use, Annex 1 (2008), and the U.S. Food and Drug Administration's (FDA's) Sterile Drug Products Produced by Aseptic Processing – Current Good Manufacturing Practice Guidance on Aseptic Processing (2004), which require continuous monitoring of airborne particle cleanliness, has been a driver for pharmaceutical companies to install facility monitoring systems.